Explore outdoors, get your shoes a little dirty, teach your kids where fresh fruit comes from and have a fun family adventure at a local U-Pick farm or orchard. Picking your own fruits and vegetables is so satisfying and something you can enjoy by yourself or in a group. Just don’t get too carried away, it is real easy to have so much fun picking that you end up with way more produce than you can eat or preserve. Of course you can always share your extras with your friends. 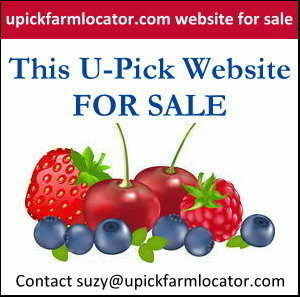 Before you go picking at any U-Pick Farm or Orchard you must first check the farm’s harvest information by either calling, visiting the farm website or facebook page. Mother Nature is an unpredictable force that may change a farms normal picking schedule and most farms frequently update their customer u-pick information with current conditions and times. What days and times is the farm open for picking? What fruits are available for picking? Does the farm also offer pre-picked fruits and vegetables? Payment options – is the farm cash only or do they accept credit cards? What is the per pound cost of the fruit or vegetable? Is there a fee to spend the day at the farm? Do they have additional kid friendly activities available? Do I need to bring my own containers or do they provide the containers? Do they have a picnic area or playground? Most farms and orchards are very kid friendly as they see the value of teaching our children where our food comes from and to appreciate locally grown produce. However, most farms are not pet friendly so be sure you know the farm’s policy on pets. Many farms also offer a variety of kid friendly activities such as wagon rides, petting zoo, corn maze and playground. Now let’s say you are ready to visit the farm and it is a beautiful sunny day. Keep in mind that you are visiting a farm and not a park. You may need to do some walking to get to the picking field and the ground may be wet and muddy despite the sunny weather. Wear comfortable walking shoes that can get dirty. Consider the weather and dress appropriately, again with clothes that may get dirty or snagged on branches. Depending on how much fruit you want to pick you may end up in the farm field longer than you anticipated. It is easy to get carried away and pick way more fruit than you originally planned. You should have an idea of what you will do with your fresh produce when you get home: do you plan to freeze or can some of it, make jam, share with friends, or just happily eat it all fresh until it is gone. Most U-Pick Apple Orchards offer a variety of apples and will help guide you to the type of apples you want (tart, sweet, cooking, firm, soft). The farm host will direct you to the area of their orchard open for customer picking and give you some general instructions. After that, you’re on your own. The apples nearest the outside of the tree will ripen first. If a variety is at its peak ripening time, start there for the best ready-to-eat apples. Choose fruit that is firm and free of nicks and bruises. Colors vary on apple types and may not indicate ripeness. To pick an apple, rotate the fruit upwards and twist. Don’t pull straight down, and never shake the branches. Gently place apples in a bag or basket to avoid bruising. Note, picked apples do not ripen more once they are removed from the branch. Some apples may be beyond your reach, do not climb the trees as you may break branches. Some orchards will supply apple picking baskets to pick those way-up-high apples. Fresh apples may be left on the counter at room temperature for a few days. If you want to save them for future eating or baking store them in the refrigerator or in a cool basement. Store them in the fridge in a separate compartment away from other produce as they give off a gas that hastens the ripening of other vegetables. If storing in the basement keep the apples separate from potatoes to prevent spoilage. Keep some apples for winter baking by freezing a few of them. Simply slice apples and freeze in a single layer on a cookie sheet. Once completely frozen, put the apple slices in a freezer-safe plastic container or freezer bag. Blackberries and raspberries are very similar and you pick them the same ways. Blackberries are always black when ripe and are solid berries to the stem. While raspberries can be red or black, depending on the variety, they are hollow on the inside. The brambles can be thorny or thornless depending on the variety. Pick only ripe berries, blackberries and raspberries will not ripen after they are picked. Ripe berries are large, plump, deeply colored, and easily slip off the stem. If you have to pull, the berry isn’t ripe. Gently place your berries in a shallow plastic container. Raspberries and Blackberries are a fragile fruit and need to be handled carefully. Do not overfill your container and pack down. Look closer, often the best berries are deep within the brambles and you may need to reach a little to find the best fruit. Keep you berries in the shade and get them to the fridge or cool location as soon as possible. They will keep a few days and possible up to a week in the refrigerator. Don’t wash them until right before you are going to use them. To wash, rinse in cold water sorting out any mushy or rotten ones. The berries freeze best if they are dry and not washed. If you do wash them make sure to drain the water then lay out on absorbent terry cloth to dry. Place the fruit in a single layer on a rimmed cookie sheet and place the tray in the freezer keeping it level. The berries will freeze in less than a day. Avoid leaving them uncovered in the freezer for more than a couple days. Place your frozen berries in freezer bags or freezer containers. The blackberries and raspberries are best if used within 6-8 months. Search for a good bush with lots of ripe blueberries. The best blueberries are round, blue, with firm skin that is not cracked or mushy. The general rule for blueberries is “the bigger, the sweeter” and what you pick is what you get as blueberries will not sweeten any further after picking. Do not pick berries that are white or small and hard as these blueberries have not begun to ripen yet. You also do not want to pick overripe, soft blueberries as they will be mush by the time you get home. To pick the blueberries, cup your hand under the cluster and simply roll the berries off the stem. If the berry does not come off with a very light touch then it is probably not ripe – leave it and move on to the next berry. You will get the hang of this with a little practice and soon you will be picking a whole cluster of blueberries with ease. Gently roll your berries into your container. Continue picking until you have all the good berries off the bush then move to the next bush. Once you have all the berries you want travel back to the counter to have your berries weighed. Make sure you wash your blueberries before eating or freezing. Blueberries will last up to one week in the refrigerator. I discovered a good technique of rinsing the berries with a water vinegar mixture to keep the berries from spoiling, click this link for details How to Keep Your Berries Fresher for Longer. Before you freeze your blueberries you need to wash them. Then completely dry the blueberries by spreading out on a layer of paper towels on the counter. Once they are thoroughly dried place the blueberries in plastic freezer bags or containers and freeze. I like to freeze about 10 pounds of blueberries to enjoy them all winter long. There are two types of cherries, sweet cherries (Prunus avium) and tart cherries (Prunus cerasus). The variety of the cherry tree, weather and temperature all determine when it is time to pick cherries. Sweet cherries will be ready to harvest earlier than tart cherries. The sugar content rises significantly in the last few days of ripening, so make sure you are picking from a tree with ripe red cherries. Cherries will not continue to ripen once picked from the tree. When the fruit is ready, it will be firm and fully colored. Harvest cherries with the stem attached if you are not planning on using them right away. Be careful not to tear off the woody fruit spur, which continue to produce fruit each year. If, however, you are picking cherries for cooking or canning, they can just be pulled off, leaving the stem behind on the tree. Cherries can be stored in the fridge for up to 10 days, placing them in perforated plastic bags. Cherries freeze really well to be used throughout the year in smoothies and desserts. Cherries can be dried using a dehydrator or your oven making a handy on-the-go snack. Many people prefer the tart cherries for making jam, although you can also use sweet cherries. You can also pickle and can cherries in a variety of methods. Check out TheKitchen.com for 10 Ways to Preserve Cherries. Harvesting grapes consists of two parts: determining ripeness and picking. Grapes grown for commercial processing go through a range of tests to evaluate the prime harvest date, the grapes need to have the ideal sugar content, the perfect pH, and the maximum flavor development. While a pick-your-own vineyard may not be as particular as a wine master, some general rules still apply. Test a few grapes by picking several from different clusters located on the upper and lower parts of the vine, and from shaded and unshaded areas. Examine the grapes’ color. Ripe grapes have a rich color, changing from green to near-blue purple, deep red or crisp white, depending on the cultivar. Feel the shape of a grape and squeeze it between your thumb and forefinger. Ripe grapes lose a bit of firmness when they ripen, and pop with juice when squeezed. Eat a few grapes one at a time to taste the flavor. If you are picking for wine making you may want perform a few more tests. To harvest grasp a grape cluster and support it with your hand. Cut the cluster from the vine using garden shears or a harvest tool, leaving about on-half the length of the stem attached to the cluster. Gently place each cluster in a bushel basket or other sturdy container. Dropping the grapes into the container can cause them to bruise. Your harvested grapes will stay fresh up to three weeks if stored correctly. First check your picked grape bunches for signs of mold, shriveling, or poor stem attachment. Discard any bad grapes. Grapes are best stored in the refrigerator. Do not wash them before storing them as this speeds up the decay process. Freeze some for use later as a refreshing snack. Freezing grapes is similar to freezing blueberries. If you wash first, make sure your grapes are thoroughly dry before you freeze them. There are many ways to preserve your grapes in addition to making wine. You can make grape jelly & jams, juice, raisins, chutney and pickled grapes. Peaches are a loved stone fruit known for its delicious juicy sweetness. It is not always easy to tell when to pick a peach at its best. The exact time to pick peaches depends on its cultivar or variety, but generally they are harvested from late June through August. Color is a great sign of ripeness. Peaches are ready to pick when the ground color of the fruit changes from green to completely yellow. There is a fine line when harvesting peaches. You want fruit at its peak flavor and sugar content, but not overripe. An under-ripe peach once picked off the tree will ripen in color, juiciness and texture, but will lack flavor and sweetness. Another sign of ripeness is testing the fruit’s firmness. Ripe peaches will “give” slightly when gently squeezed. Peaches get sweeter and juicier as they ripen. Once you get your peaches home, store them at room temperature shoulder (stem) side down, preferably in a single layer to avoid bruising. You can line them up in the order of ripeness so you know which one to eat next. If the peaches ripen before you get to them, they can be stored in the refrigerator for a couple more days. If you picked enough to eat fresh and also some extra to preserve for eating later you have a couple options. Peaches can be sliced and frozen or canned using sugar syrup. Find tips to preserving your peach harvest at thepeachtruck.com. Make memories with your family with an annual outing to a local pumpkin patch where you can walk out into the farmer’s field to pick a pumpkin from the vine. It is easier to harvest the pumpkin than it is selecting just the right shape and size for your Halloween jack-o-lantern. Pumpkins are generally ready to harvest when the fall days get shorter and your mornings are chilly. A pumpkin that is ready to harvest should be fully colored – whatever that color is supposed to be. The rind should also be firm. If your fingernail easily pierces or creates an indentation in the skin, the pumpkin is not ready to pick. If you pick a pumpkin that is too soft and not yet ripe it will shrivel in just a few days. To pick, twist the pumpkin where it is attached to the main vine being careful not to disturb the other pumpkins still growing. Strawberry picking is a great family activity, you get to take a drive into the country, pick strawberries at their peak of freshness and enjoy eating this delicious fruit by the handfuls. Kids are great strawberry pickers since they are closer to the ground and can see ripe berries others may have missed. Strawberries are a very tender fruit and need to be handled gently to avoid bruising. To pick, grasp the stem just above the berry between your forefinger and thumbnail and pull with a slight twisting motion. Allow the berry to roll into the palm of your hand. Carefully place the strawberries in your container and don’t overfill the containers to prevent crushing the fruit. Pick only berries that are fully red and firm not overripe and mushy. Strawberries to be used immediately may be picked any time, but if you plan to hold the berries for a few days, try to pick in early morning or on a cool, cloudy day. Berries picked during the heat of the day become soft, are easily bruised, and will not keep well. Avoid placing the picked berries in the sun any longer than necessary. It is better to put them under a shady tree than in a hot car. Cool them as soon as possible after picking. When you get home, sort but do not wash them until just before you use them. Store the berries uncovered in the refrigerator in shallow container. Strawberries may be kept fresh in the refrigerator for 3 or more days – check daily for signs of spoilage. After a few days in storage, however, the fruit loses its bright color and fresh flavor and tends to shrivel. You can preserve your strawberries by freezing, canning or making into sweet jams and preserves. Follow this link for helpful information on how to store your strawberries. Tips on Picking and Using Strawberries.